New York, New York (January 8, 2014) – Taymour Grahne Gallery is proud to present 'Kesh Angels, a solo exhibition of work by the Moroccan-born, UK-based artist, Hassan Hajjaj. Marking the artist’s first exhibition in New York, ‘Kesh Angels presents a unique take on the vibrant street culture of Morocco and pays tribute to the biker culture of the young women of Marrakesh in a series of photographs, limited edition objects, an installation, and a video. Borrowing from the tradition of African studio photography and the glossy aesthetic of the fashion shoot, Hajjaj’s work combines the personal with the political, the individuality of his subjects framed by consumer goods and adorned with the trappings of culture and branding. The handcrafted inlaid wood frames are made up of quotidian branded objects like soda cans and Moroccan packaging, mixing old and new, both responding to and completing the works they surround. The exhibition is also accompanied by a book on the last decade of Hajjaj’s work, published jointly by Taymour Grahne Gallery and Rose Issa Projects, London. Concurrently, the artist’s three-channel video installation My Rock Stars, Volume I (2012) is on view at the Los Angeles County Museum of Art, California, through 20 July, 2014. The work, which features performances by international musicians wearing clothes designed by Hajjaj, is a recent acquisition by the museum. 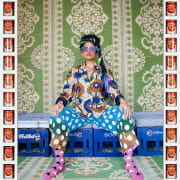 Hassan Hajjaj left Morocco for London at an early age. Heavily influenced by the hip-hop, reggae, and club scenes of London as well as by his North African heritage, Hajjaj is a self-taught and thoroughly versatile artist whose work includes portraiture, installation, performance, fashion, and interior design, including furniture made from recycled utilitarian objects from North Africa, such as upturned Coca-Cola crates as stools and aluminum cans turned into lamps. ' Kesh Angels features an installation of his furniture in the lower gallery, completely transforming the space into one of the artist’s signature lounges.